Arrived in Santa Monica, Los Angeles yesterday. Had a decent time in San Diego, not quite got that California feel but a decent city anyway with really good night life in the gaslamp district. We visited the San Diego zoo which is considered world class and was really good. Most impressive of the animals by far were the polar bears which are ridulously huge but also quite graceful. Huge gorilla was impressive as well and we watched to little monkeys fighting for about 10 minutes. 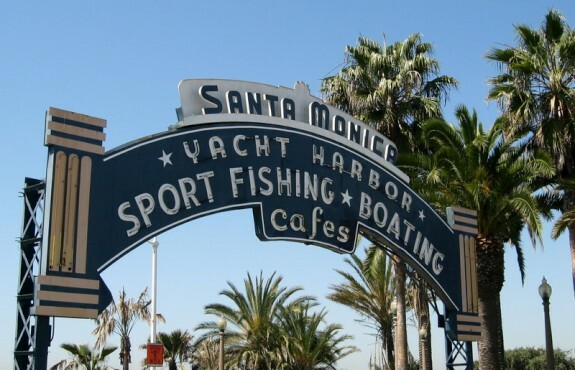 Santa Monica is an LA beach town. We have three days booked here and plan to use it as a base to explore LA. After that we will probably book one night in Hollywood. Santa Monica really feels like California, gorgeous women everywhere. Has a cool little pier and a really nice beach. I had my first ever dip in the pacific ocean today. I can see why Cali is so famous for surfing, the waves were huge even when the water was only up to my waist. Incredibly powerful waves, easily higer than our heads, took me under a few times. Wouldn't dare wade out further than waist level. Finally getting some washing down. all of my clothes our stinking. The hostel here is really nice, big, celan, and lots of ameneties. More like a hotel aimed at backpackers really. They had an all you can eat bbq tonight for $6 so just had dinner. Probably check out the town tonight. Tomorrow we plan to check out a farmers market and then get a bus to downtown LA. The day after we will probably bike down along the beach to the town of Venice.